Just2Trade Online Ltd is a Cyprus-based financial firm that is regulated by CySEC, the Cyprus Securities and Exchange Commission. They offer the world’s markets for traders in the retail world, allowing access under the MiFID (Market in Financial Instruments Directive that has been in effect in the European Union since November 2007, making sure that investors are indeed protected while being served by the company. The true global reach of offerings is one of the biggest attractions to be found here, as the ability to access over 30,000 financial instruments is a rare thing to see for retail clients. Beyond that, Just2Trade is adding even more markets in the near term, which will only add to the growing list of tradable securities. 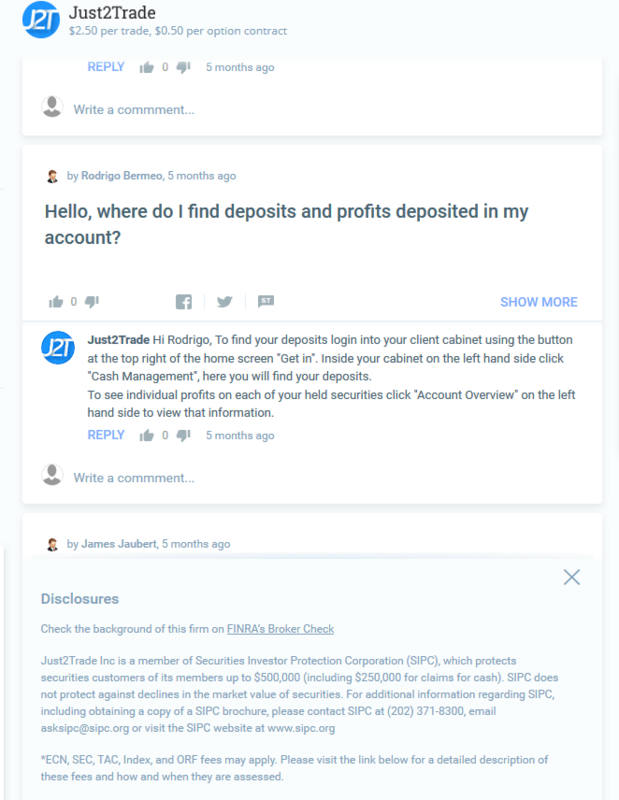 Just2Trade has its own proprietary platform available for Windows, Android, iOS, and a web-based version. Known as ROX, is allows traders to access their accounts from anywhere in the world, and has a plethora or trading tools built into it. The charting in the platform is top-notch, and allows a clear view of the instrument you are trading. There are over 30,000 financial instruments available through the broker, and they are clearly shown here. Just2Trade MetaTrader 5 is a familiar friend to the trading community. If you have ever traded Forex, you almost certainly have used a version of this platform. The MetaTrader ecosystem is the most widely used platform for currency traders, and with good reason. The charting, execution, and addons that are available are some of the best in the world, allowing traders to automate their strategies, use custom indicators, and so much more. Beyond that, MetaTrader works with a coding language known as MQL, which is very simple and easy to work with if you have any coding experience. This allows the building of custom enhancements for the platform. It should be noted that the US division cannot offer MetaTrader 5 though, as seen on the site. Just2Trade TradeX Lite is the web-based platform that Just2Trade offers. The platform is basically the same as the ROX Premium package, but able to be accessed from anywhere that has internet access, and of course a modern browser. CQG Desktop is offered for futures trading only, as it is an industry standard when it comes to day trading futures. There are also some other versions of this platform available, such as Qtrader, Integrated Client, and Trader. All of these are top-notch and well developed platforms from CQG that thousands upon thousands of traders have trusted. NASDAQ, NYSE, Euronext, Frankfurt Stock Exchange, London Stock Exchange, Börse Frankfurt, German XETRA, American Stock Exchange, Tokyo Stock Exchange, Hong Kong Stock Exchange, Russian FORTS, Russian MICEX, Mexico MXSE, Thailand SET​ and some to come. Just2Trade commissions are somewhat complex to say the least. There are straightforward numbers for somethings, but in the end a lot of it comes down to your account balance. The advertised rate for NYSE/NASDAQ markets are from $0.0025/share, but in reality it all comes down to turnover per month, so it is more likely to be closer to $0.006/share. Many of the other exchanges are based upon either 0.15% of the trade, with a minimum, such as 3 EUR per trade at Euronext, and 3 GBP at the London Stock Exchange. Keep in mind this doesn’t include the exchange and clearing fees, which the broker has no power over. Stock options and index options are also available for trading, but much like the other products will have a set fees for the transactions on US markets based upon total volume as well. Commissions in other markets are also sensitive to the total turnover that the trader brings to the brokerage. For example, if you are looking to trade futures on the GLOBEX, trades can start at just $1 per side, but if you do less that 500 a month, the rate is actually going to be $1.50 per side. Crypto is $15 per side at the CBOE, while $20 at the CME. While not a few per se, the one thing that you will probably have trouble finding on the site that there is a minimum amount required to open an account in the form of $3,000 to enjoy active trader status. This is where the price of your transactions can perhaps be much lower going forward. Just2Trade offers market research and analysis for the US stock market, however it is not for free unless you have certain amounts in the account, starting at $10,000. The fees start at $0.02/share if you don’t reach that threshold. Options are $5/contract as well in that scenario. The availability of asset management is another thing that a lot of traders will like, as they work with the stock markets in North America and Europe. Beyond these two services, there isn’t much in the way of research or education, especially in the realm of education, which is all but nonexistent. The brokerage is clearly not here to hold a trader’s hand through the process. There are a multitude of retail brokers out there that have great educational areas, but Just2Trade seems to be focusing more on expansion of available financial products more than anything else, as seen by the long list of stock markets that they are going to add soon. Customer service isn’t as stringent at Just2Trade as some of the other brokers that we have looked at. With this in mind, the customer service is available during normal working hours in Cyrpus, or New York, depending on where you are. The chat feature on the website as well as a community chat area is probably the first route most people will take, but there is also email and phone available as well. Just2Trade has an interest look and feel to the site, and is a bit disconnected in its layout. It isn’t always easy to find information, and of course the higher threshold to some of the extras will be a turn off to a lot of people. In that sense, this is where you go once you already know what you want, and perhaps more importantly what you don’t need. However, the massive amount of assets available will be a big attraction for many people. The great variety will of course allow people to diversify their portfolio and mitigate risk, something that is paramount in the current market situation. However, paying attention to the complex fee schedule is something that we advise, as the cost will vary greatly depending on the market you are trading. The brokerage reminds us a lot of some more established global platforms like Interactive Brokers, SpeedTrader and Zacks Trade, but it is much younger, meaning that the broker is still going through some growing pains. The ability to switch back and forth from Forex, Options, Stocks, Crypto, and Futures is a major advantage that we see here. The platforms are good and functional, as well as well-developed. The biggest issue that we see here is the customer support, which seems a bit lacking. The community support area on the site shows signs of being a bit lackluster, as some of the questions weren’t answered when we looked at the site. The frustration of a few customers was relatively obvious, so this was a bit of a red flag at that point. Another potential downside in the eyes of some traders and investors is the fact, that Just2Trade is based in Cyprus and not within the United States.